My husband is in the service industry, so his job requires him to wear steel-toed boots. If you also have a husband who wears steel-toes, then you also know that we are keeping the sock industry in business. Of course it is not just my husband who shreds the toes of his socks, my son is just as bad because he walks with his toes up. So we basically have a long standing bill every three months to buy two large packages of socks. The socks that I buy for the husband are Hanes 10 pack Men Cushion Crew Socks for $12.72 at Wal-Mart. Aeropostale socks used to be the order from my son, but at $15.00 per 6 pairs of socks (before tax), we had to make the switch to Hanes 6 pack Black Ankle Socks for the same price as Papa’s for $12.72. Now, that might not seem like a whole lot, but if you add that up for a year, we are shelling out $101.76. I don’t know about you, but I would like a check at the end of the year for $100.00, and if I fix the socks for the men in my life instead of buying them more, well that’s exactly what I would be doing….handing myself a check. Yeah, I want that check. First: Thread your needle, knot your thread, and then set aside. 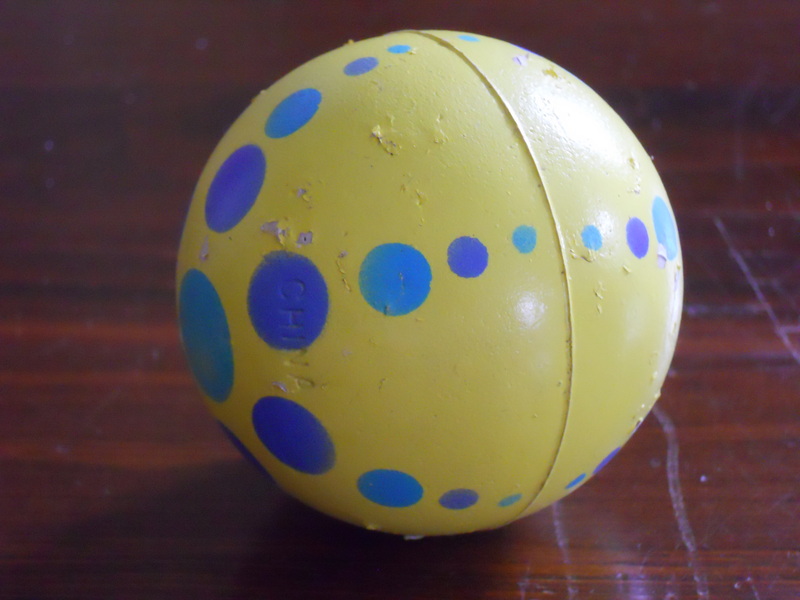 Second: Turn your sock inside out, insert rubber ball and bring it down to the toe of the sock, then locate the hole. 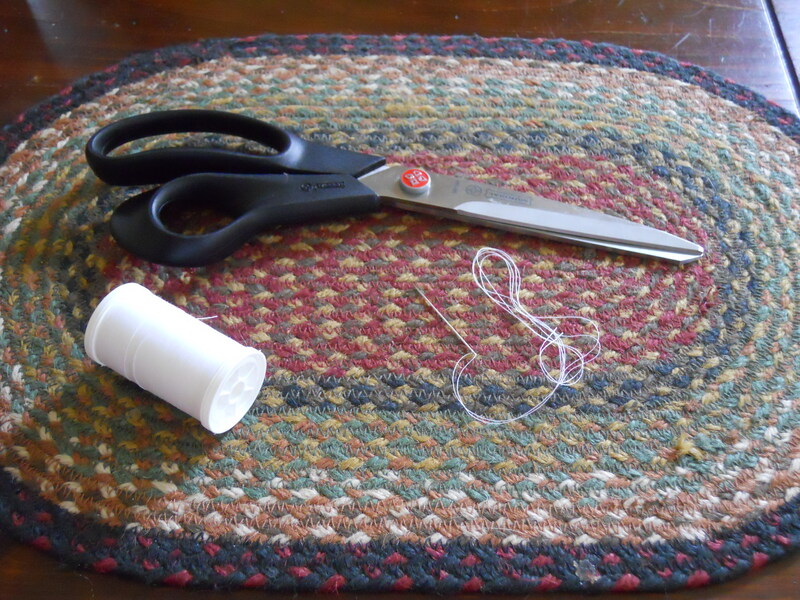 Third: Insert needle, make a stitch, then stitch again stitching through your first stitch to lock it into place. Fourth: Continue with stitches tight enough to close the hole, BUT not too tight. Otherwise, your husband or son will feel a hard lump in his shoe and not wear the sock again, then all of your frugal efforts will have been wasted. 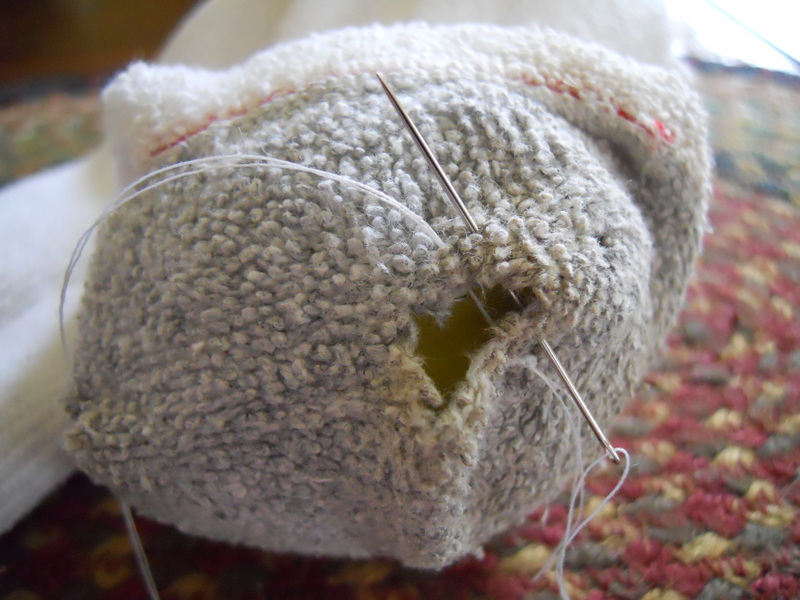 Fifth: Lock your last stitch in place by making two stitches in that last stitch. Sixth: Sit back in your rocking chair by the fire, and pretend you are Ma Ingalls and you just ‘darned’ Pa’s socks! 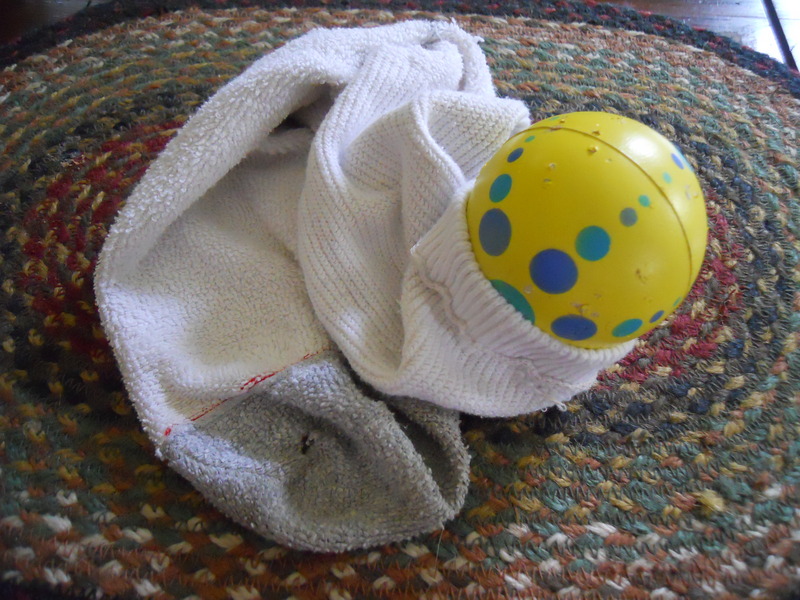 Turn sock inside out and push the ball in all the way to the toe. Sew the hole shut but not too tightly. There you have it folks. 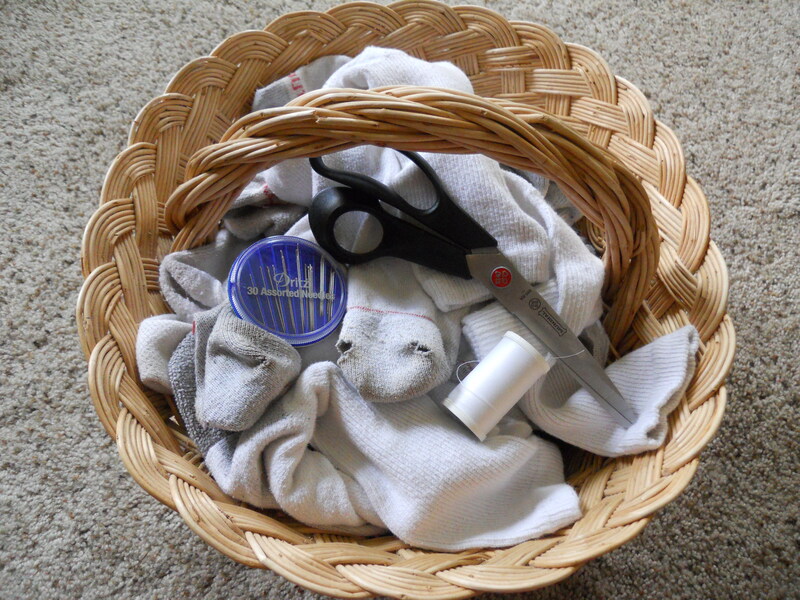 Once your done sewing all of those holes in all of those socks, you can sit back and figure out what your going to do with your $100.00 check! My husband also wears steel-toed boots, but we switched from the regular Hanes socks to the extra padded ones (grey toe stripe instead of red). They have extra material in the toe and heel areas, plus are just a little plushier everywhere else. 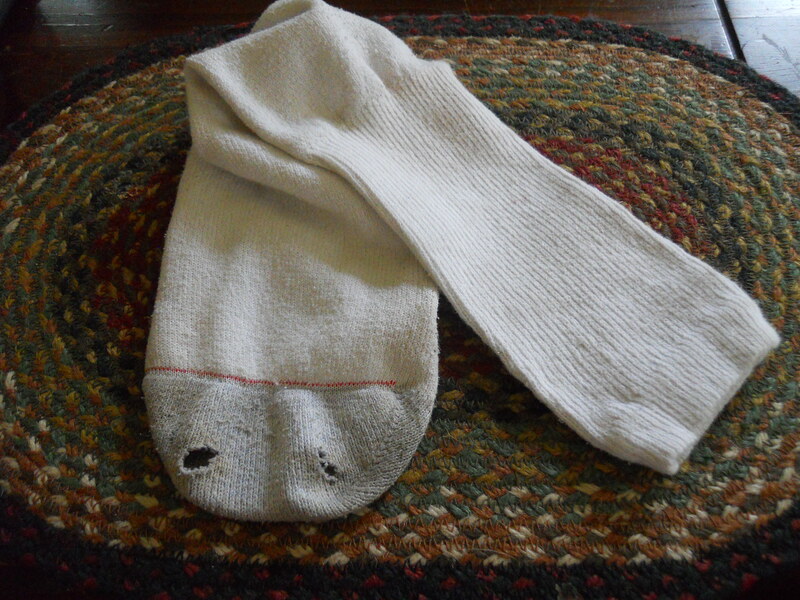 They are a bit more expensive, but I haven’t had to purchase socks in nearly nine months. Plus, my husband says they feel better than the thinner style. I agree with him–I steal them from his sock drawer and wear them around the house in winter. I find them online at Hanes.com, and I stock up when they offer free shipping.